In addition to being accessible via Fastly's application programming interface (API), Fastly services can also be accessed via a web interface for users with the appropriate access permissions. NOTE: Not all Fastly service features are enabled by default. 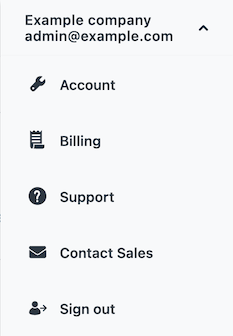 The appearance of the web interface controls may change from the defaults displayed once these services are enabled for your account. Access to Fastly's web interface controls requires you to sign up for a Fastly account. Creating an account is free. Once you've created an account, you can navigate to the controls via the Fastly login page at https://manage.fastly.com, either directly using any standard web browser or by clicking the Login link at the top right of almost all pages at the Fastly website. Once logged in to a Fastly account, the web interface controls appear as appropriate based on the roles and permissions assigned to you. The All services page displays a summary of all your services, sorted by requests per second. It appears automatically when users with the appropriate access permissions log in to the Fastly web interface. You can access it by clicking Home next to the stopwatch icon. You can also search for a specific service associated with a domain by typing the domain name in the Search by domain field. The domain name you type must be an exact match to find the desired service. The Stats page provides you the capability to monitor your real-time analytics and view your historical caching statistics for your services on the web interface. Real-time stats information, which allows you to monitor cache activity for your services. Historic stats information, which displays your historical stats derived from your site’s statistical information. The Stats link appears automatically for logged in users with the appropriate access permissions. The Real-time stats page allows you to separately monitor caching for each of your services in real time, as they operate on a second-by-second basis. The data on this page may appear grayed out or blank to some users, with no information displayed in the controls, when a customer's service does not receive enough requests for Fastly to display meaningful information about it in real time. Global POP Traffic: a heat map displaying global POP traffic through all POPs for your service. Requests: a graph displaying the total number of requests received for your site by Fastly over time. Errors: a graph displaying the number of error requests that occurred over time. Hit Ratio: a graph displaying the percentage of content being accessed that is currently cached by Fastly over time. Bandwidth: a graph displaying the bandwidth served from Fastly's servers to your website's visitors. Image Optimization Requests: when enabled, a graph displaying the number of responses that came from the Fastly Image Optimizer service over time. Origin Latency: a histogram displaying the average amount of time to first byte (measured in milliseconds) on a cache miss or pass. High origin latency means that your backends are taking longer to process requests. Not enough data is going to your site. If this is the case, visit the site yourself to trigger some traffic. You've made a CNAME change. If this is the case, it could take from a few minutes to hours for the change to propagate your DNS servers. See how to edit your DNS record to point to Fastly for more information. Once you start seeing real-time cache activity, you also can interact with your stats graphs. The Historic stats page provides a visual interface to our Stats API for a selected Fastly service. The graphs display metrics derived from your site's statistical information. Hit Ratio metrics tell you how well you are caching content using Fastly. This metric represents the proportion of cache hits versus all cacheable content (hits + misses). Increasing your hit ratio improves the overall performance benefit of using Fastly. Cache Coverage metrics show how much of your site you are caching with Fastly. This metric represents the ratio of cacheable requests (i.e., non "pass" requests) to total requests. Improving your cache coverage by reducing passes can improve site performance and reduce load on your origin servers. Caching Overview metrics compare Cache Hits, Cache Misses, Synthetic Responses (in VCL edge responses), and Passes (or requests that cannot be cached according to your configuration). Requests metrics show you the total number of requests over time that were received for your site by Fastly. Bytes Transferred metrics show you the total number of bytes transferred by Fastly for your service. Header & Body Bytes Transferred metrics show you the relative values of bytes transferred when serving the body portion of HTTP requests and the header portion of the requests. Miss Latency metrics show the distribution of only the miss latency times for your origin. Error Ratio metrics show you the ratio of error responses (4xx and 5XX status code errors) compared to the total number of requests for your site. This metric allows you to filter types of error responses and quickly identify error spikes at given times. HTTP Info, Success, & Redirects metrics shows the number of HTTP Info (1XX), Success (2XX), and Redirect (3XX) statuses served for your site using Fastly. Status 3XX Details metrics shows the breakdown between the number of HTTP Status 301s, 302s, 304s, and other 3XX requests. HTTP Client and Server Errors metrics shows the number of HTTP Client Errors (4XX), and Server Errors (5XX) served for your site by Fastly. When enabled, Image Optimization Requests metrics show you the number of responses that came from the Fastly Image Optimization service. Once you start to see your caching and performance metrics, you also can interact with your stats graphs. You can interact with and control your Real-time and Historic stats graphs as follows. Hovering the cursor over any part of a graph displays a timestamp indicator that updates itself as you move the mouse. The average line appears as a dashed line on some graphs. To hide the average line for a graph, deselect the Avg checkbox. the Global POP Traffic heat map displays a larger view of the graph as well as the traffic in each POP region, with continuously updating data on the POP's current requests per second, the request error ratio, and the bandwidth going through that POP. the Requests, Errors, and Hit Ratio graphs expand to larger versions of themselves along with the already expanded versions of the Bandwidth and Origin Latency graphs. the Origin Latency graph specifically includes a small gear icon in the upper right corner that allows you to change the interval limit displayed by the graph from the default 15 second interval to a shorter time frame. The Real-time graphs update continuously. Leaving the graphs open for long periods of time, however, can occasionally lead to higher CPU utilization. To improve performance, you can deselect the Smooth scrolling checkbox. The graphing animations may not be as smooth when this checkbox is deselected. Service version activations appear as vertical lines on the Historic graphs. Hovering your cursor over any line displays the version's number and its activation timestamp. IMPORTANT: You cannot retrieve minutely historical statistics data older than 90 days from the current date. Contact support@fastly.com to discuss your minutely data needs. You can control how you view the historic stats date ranges. Clicking this button on any graph (including those on the Real-time stats page) lets you change the display of the graph's data to an average, a 95th percentile, a minimum, a maximum, or a total. When set to average, the graph displays the average as a dashed line. You can also exclude certain data entirely. For example, in this Caching Overview graph, hovering the cursor over the word "Hits" next to any of the data values displays a small, clickable hide link. Clicking this link will hide that value in the graph's display. Notice that the actual numbers of the hidden data still appear grayed out in the controls, but the hide link changes to a show link and the graph itself doesn't display the hidden data at all. The Configure page allows you to define exactly how each instance of your cache should behave and deliver content from data sources. The Configure page appears automatically for logged in users with the appropriate access permissions. You use the Configure page to create versions of each of your service's configuration settings and then use the controls to activate or deactivate them. With the appropriate permissions, you can activate configuration changes immediately and roll back those changes just as quickly should they not have the intended effect. The Configure page also allows you to compare differences between two configuration versions. Depending on your access permissions, it provides access to a variety of account-specific and personal settings information. Specifically, it gives you access to Account details, Billing information and access to Support. It also provides a way for you log out of the web interface.